These bad boys have been all over the internet….so I decided to give it a whirl and then share the success with you all! I am always on the lookout for easy recipes….easy to prep, easy to cook, and easy to clean and keep. And easy for me means minimal cook time and storage space. These little gems fit the bill to a T! I found the original recipe on Eve Was (Partially) Right > a clean eating site that I’m becoming quite the fan of! And she found hers, which she modified a bit, on Hungry Girl. I totally modified mine…I really just used the idea and ran with it…it feels like I can’t ever just follow a recipe…I always feel the need to change this or tweak that. 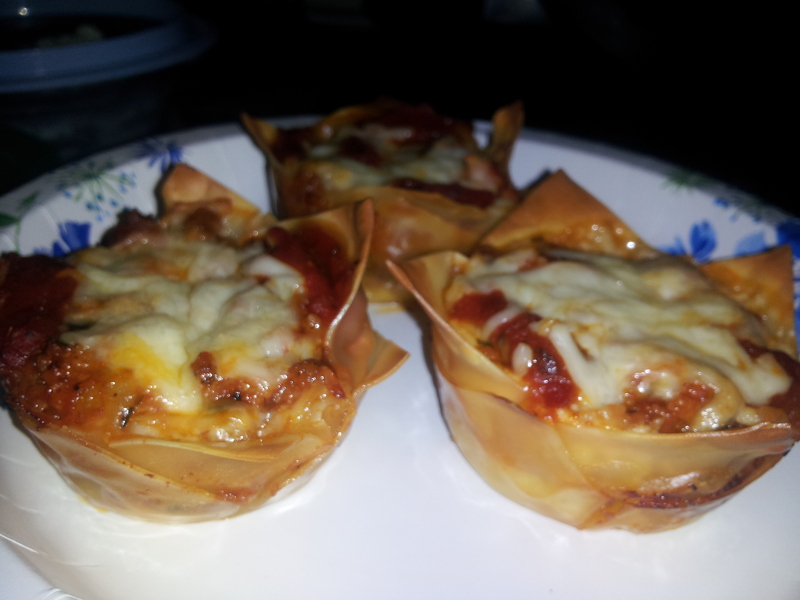 So, with that in mind, here is my recipe for Lasagna Cups. As I said earlier, I tend not to follow recipes to the letter…so I’m intentionally leaving you room to make it your own. 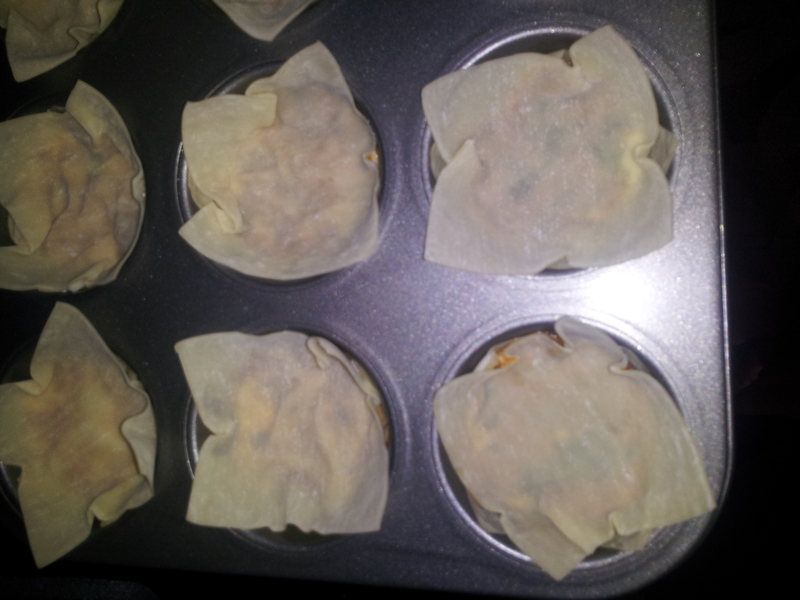 The key here is in the wonton wraps and the layering. The rest is up to your taste buds! 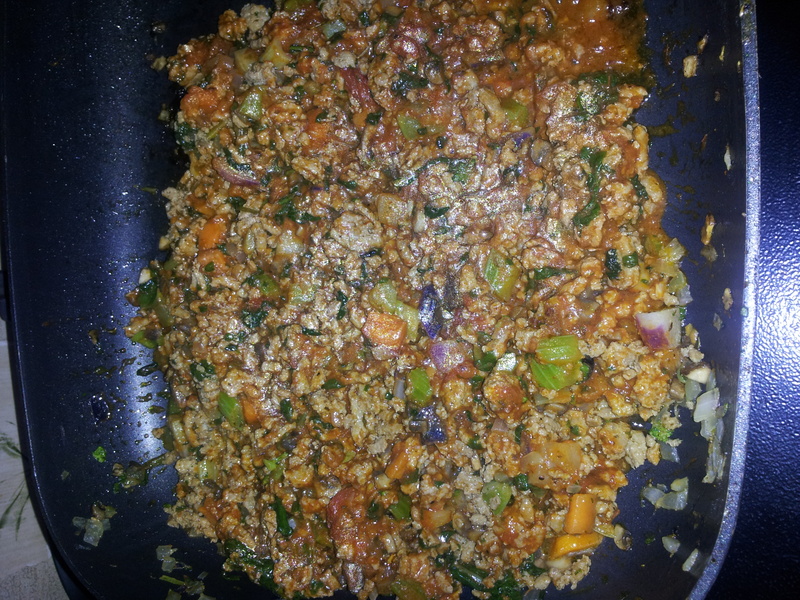 First, heat up a skillet and toss in your ground meat, chopped veggies and some herbs/spices. By the time the meat is cooked the veggies are soft enough to let the oven do the rest of the cooking. Once the meat is cooked then add some sauce…however much you want…I tend to go for the ”sloppy joe” consistency! 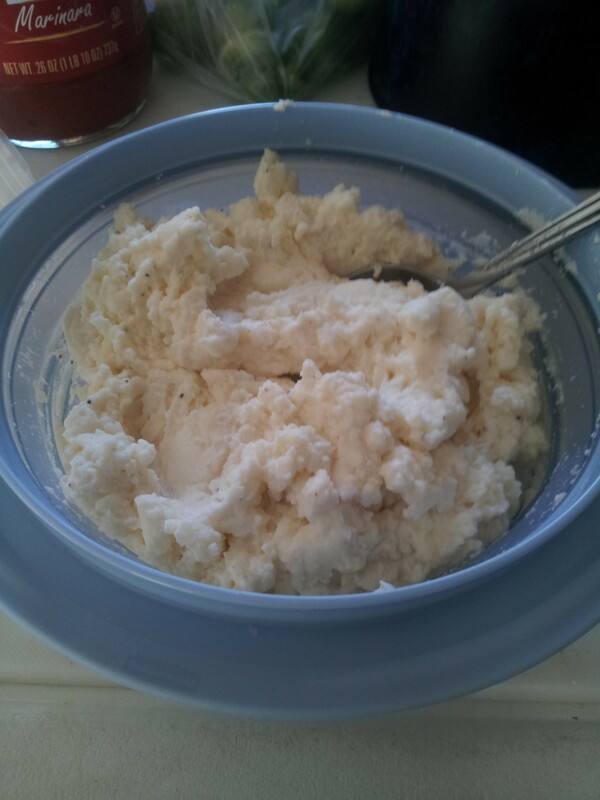 Then put a dollop of the ricotta mixture into each one….I’d say somewhere between a tsp and tbs, followed by another dollop of the meat/veggie sauce. If you’re like me you like cheese….so at this point I sprinkled on some mozzarella and then layered on another wonton wrapper. With this one you want to smush it down so the bottom ingredients are firmly filling out the cup. And now you layer on another dollop of the ricotta mixture followed by the sauce. I thought mine looked a mite dry so I put about a tbs of marinara on top of the meat mixture and then sprinkled on some more mozzarella. These babies are ready for the oven! 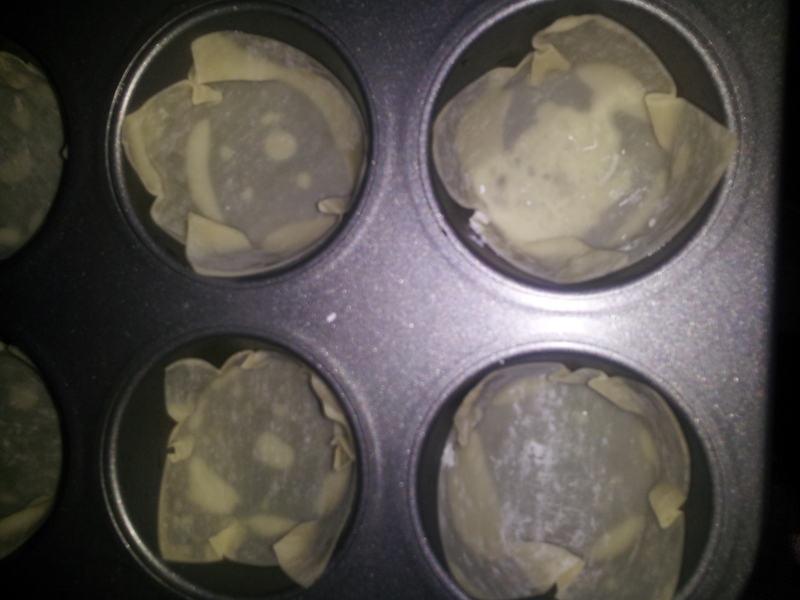 Pop them into a preheated (350) oven and bake them for about 12 minutes or until the tops are starting to brown. Pull them out and let them sit for a few minutes. 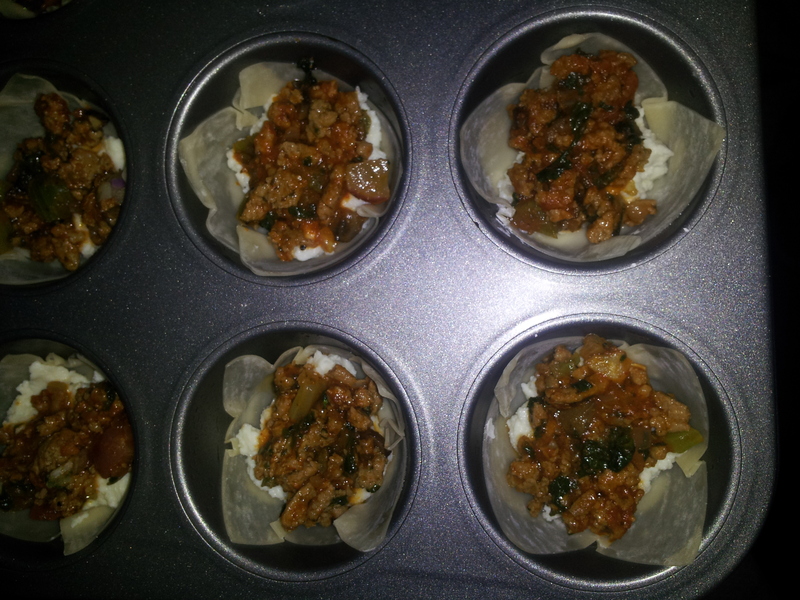 As they sit the bottoms will firm up creating an easy to eat lasagna cupcake! Be careful though…the insides stay hot for quite a while! 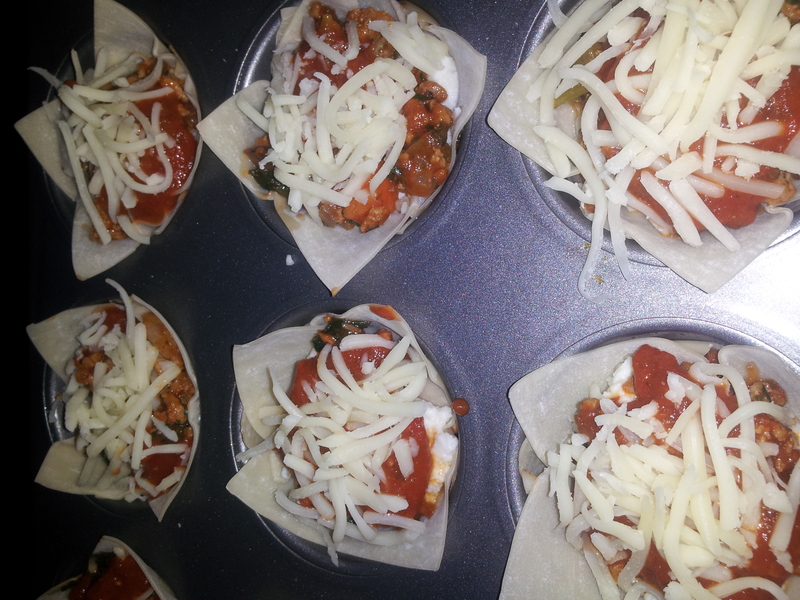 They way I did mine gave me almost 24 lasagna cupcakes…the last few didn’t have ricotta cheese in them because I ran out…so I just used extra mozzarella. The kids were all very happy with this dinner. We served about 3 each with salad, some sauteed brussel sprouts (thanks chachi!) and mixed fruit. We have leftovers for lunch today…yummo! Let me know if you all try this recipe and how you made it your own! Goodluck! This is an amazing idea! I could so see this being a “portion control” helper for me! A couple of these and a nice big salad or veggie side! Thank you!!! i just realized that! maybe taco’s….hmmm…what else ya got?